Often, after you make an investment on purchasing or renewing your home server, you will want to keep the hardware in top notch condition. 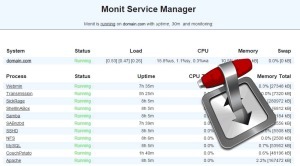 With this complete Monit setup guide, you will learn how to keep your server in check, to ensure a proper performance; and get alerts when this performance drops, so you know your server requires attention. If you haven't built your server yet, take a look at this Energy efficient budget HTPC-NAS combo build, which is a great configuration if you're just starting. Also read up on home server software such as CouchPotato, SickBeard, SickRage, and Sonarr, to expand the capabilities of your device. How to install Webmin on Ubuntu and secure it? How to install qBittorrent with webui on Ubuntu? 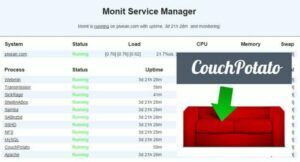 To continue with our complete Monit setup guide, we will show you how to use Monit to keep your server system load in check, in CPU, RAM and Swap. If the resource usage is high on any of them, Monit is capable of sending you an email alert. This email alert can get to you wherever you are (for example, if you are at work, you can be notified of the issue and fix it when you get home). The conditions for which an alert is sent are fully customizable and you can tweak them in order to get the best experience. HDD space is an important parameter of home servers, because that's where our files are stored and determines how many we can keep. With this Monit setup guide for HDD monitoring, you will learn to determine what partitions need to be kept in check, as well as knowing how full any of these partitions are at any given time. You will learn how to test and reload Monit with Monit config examples that will ultimately show available disk and partition space via the Monit web interface. A neat addition to any home server! With this Monit setup guide you will learn how to configure Monit in order to send you alerts whenever the motherboard temperature of your home server is high. This will allow you to take corrective actions and maintain adequate cooling on your device. Monit is able to send you email alerts if the motherboard temperature goes above a certain threshold. Of course, it goes without saying, that in order for Monit to be able to work properly in this case, your motherboard needs to have accurate and functional temperature sensors. Another critical part of your server that should be always monitored and in top notch condition is the CPU, also known as Processor. These are often expensive. Furthermore, since home servers are most of the time designed to be quiet, cooling for the processor is often passive, which means there are no fans or moving parts, and it might be easy for the CPU to overheat in these cases. Monit is of course able to send email alerts if the CPU temperature is higher than a user-defined threshold, and you will learn how to configure this with this Monit setup guide. NAS and server drives are prone to failure from time to time. It is important to keep an eye on them , to monitor their health and temperature, and ensure proper operation. Monit keeps the SMART health status and hard drive temperature in check, and if they change in a way that could signal a failure, Monit can also email you about it. With this Monit setup guide you will learn how to determine the partitions and drives to monitor, as well as installing smartmontools and then creating Monit scripts for hard drive health and temperature. 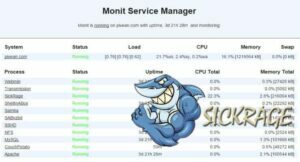 Besides helping you keep your hardware in check, Monit can also help you monitor file servers and web servers, to ensure continued operation and even solve certain problems by itself. Take a look at these Monit config examples to keep your servers operating smoothly. 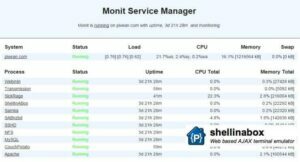 You can also monitor individual processes with Monit, to know the status of certain apps within your home server, giving you an extra level of control and insight over your server performance, no matter where you are. SickBeard enables you to set up a system for automated TV show download. This is amazing, however, it is likely to fail at one point or another. It is important to keep SickBeard always active in order for your TV shows to download without issue, and that's exactly what Monit helps you accomplish. Not only can it try to email you in the event of a failure, it can also restart the SickBeard process on your Ubuntu server, which is always a nice thing, specially if you are away from your server for extended periods of time. Maybe you are trying to decide whether to use SickBeard or SickRage. You are out of luck if you wanted to use Monit compatibility as a deciding factor, because it works well with both. 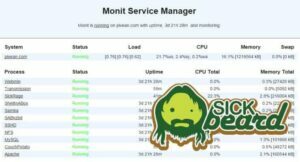 This Monit setup guide will teach you how to configure Monit to work with SickRage, monitoring its status and keeping it active. You can set it up to notify you of failures via email (which you can get on your mobile device), as well as trying to restart SickRage automatically in the event it fails and stops working on your Ubuntu home server. Monit can also monitor SABnzbd to keep it running and ensure that your downloads are carried out in an efficient way. It is possible that Monit restarts SABnzbd or any process and it fails again. 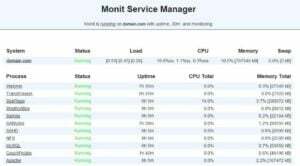 For these cases you can configure certain intervals and number of restarts, and whenever that number of restarts is exceeded, Monit will stop monitoring the process. This is done to avoid filling your email inbox with repeating notifications, and is also effective since you would get the emails anyways, from the first restarts. 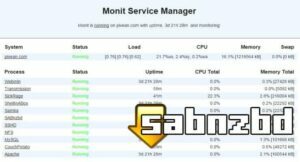 You can learn how to monitor SABnzbd with Monit in this Monit setup guide. 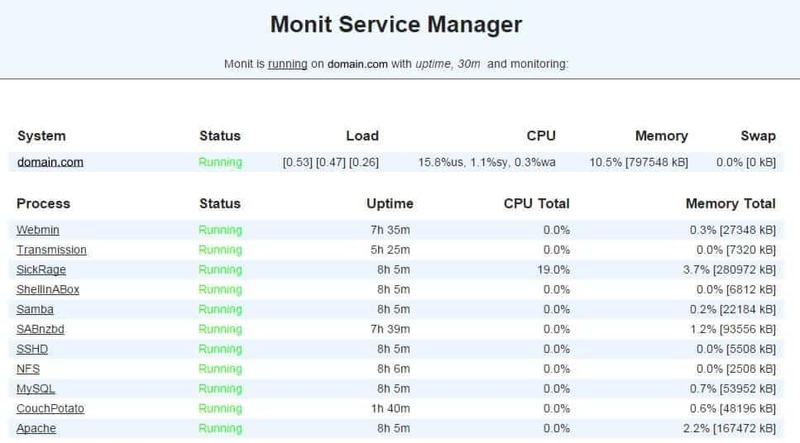 Learn how to configure Monit to work with Webmin and keep it monitored. In this tutorial you will find out how to keep Webmin active on your Ubuntu server. This is critical, because Webmin lets you manage your server remotely, but for this to be possible, the Webmin process has to be active, of course. What happens if you try to connect to your server through Webmin, but it has failed before that? You won't be able to connect. 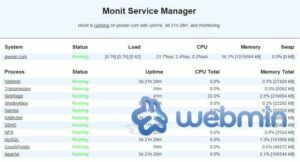 With Monit, you can be notified when the Webmin process fails, and also let Monit attempt to restart it, to keep it always active on your Ubuntu server. If you prefer getting your downloads via torrent, you are probably a user of qBittorrent. Imagine you're waiting on your movies and shows to download, only to find out that your qBittorrent process crashed many hours ago. Frustrating, right? 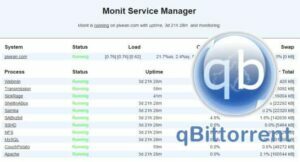 With this Monit setup guide you will learn how to configure Monit, in order to ensure that your qBittorrent process is always active, as well as notifying you via email if some problems arise with this application on your Ubuntu home server. Transmission is another application that needs to be constantly running in your automated home server. With these Monit examples you can learn how to configure this software in order to constantly monitor your Transmission WebUI, to ensure it's always working, restart it automatically in case it fails, and notify you via email. It is necessary to monitor this application, specially if you plan on accessing your transmission WebUI from outside your home network, which would allow you to monitor the status of your downloads from any web browser. ShellInABox allows you to control your headless (i.e. no monitor attached) server from another machine, even if it's not on your home network. With this Monit setup guide you will learn how to configure Monit in order to restart ShellInABox automatically, as well as notify you via email if ShellInABox fails. This is important if you have remote access enabled, because you may not be able to locally restart your server, so Monit can be set up to attempt doing it on your behalf, which is awesome and adds a level of strength to your fully automated configuration. With these tutorials you will hopefully get the most out of your Monit installation, and have your home server closely monitored, not only to extend the useful life of your hardware, but also to keep your server working at all times, which is extremely convenient. Your server is working perfectly? Then take a look at this Emby vs Plex comparison to make sure you choose the right media manager for your needs. You can also browse these 5 best Plex clients for a better media streaming experience with your home server! Guide: How to install Kodi Navi X addon?